City Conversations today revolved around the controversial City decisions and subsequent court case surrounding a land swap between the city and a developer at Richards & Helmcken. Jubilee House is an existing somewhat run down facility that is in need of replacement. The developer proposed to build a replacement at 1099 Richards St.that would add 75 rental suites, and would then build a 36-storey tower on city owned 508 Helmcken beside Emery Barnes Park. On January 27 the BC Supreme Court ruled that the process was flawed and the development could not proceed until there was a new public hearing. The B.C. Court of Appeal has sided with the City of Vancouver and Brenhill Developments in a high-profile case against the Community Association of New Yaletown. This morning, Chief Justice Robert Bauman delivered the news, telling those in the courtroom that written reasons will be provided later. The decision overturns B.C. Supreme Court Justice Mark McEwan’s ruling last year that voided a rezoning and a development permit to allow for a 36-storey residential tower and a 13-storey housing complex just north of Emery Barnes Park. The presenters at the conversation were John Green of the Community Association of New Yaletown – supported by their lawyer Nathalie Baker – and Alice Sandberg of the BC Nonprofit Housing Association. John Green opened by saying that the entire city development process was new to all of the CANY members. He said they were in favour of social housing but the city had rammed through the redevelopment in an unfair process: “it didn’t matter what we said”. 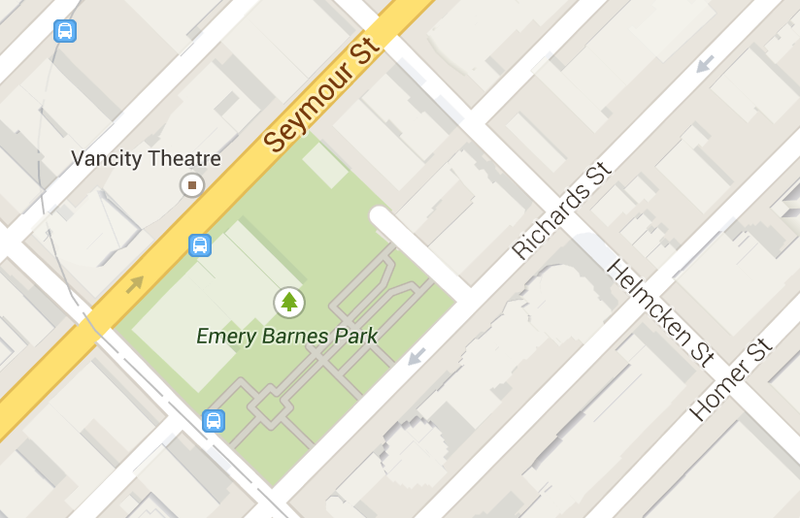 Emery Barnes Park is in the heart of the downtown towers – not at the edges like all of the other parks. It could probably do with some enlargement. The Urban Design Panel examined the proposed deal on 27 March 2013 and found that the tower floor plate was too large, the development too dense for the site. Despite this the City Planner at their next meeting urged them to reconsider the proposal – even though there had been no changes – and it was approved. On July 16 there was a public hearing into the rezoning, where it was noted that there were several violations of the Official Development Plan for the area – five times the density, four times the height and with a six foot setback instead of the prescribed twelve feet. People in the area felt that the development was not a good fit. They felt there was a lack of transparency on the deal between the developer (Brenhill) and the City. Overall there would be no increase in social housing as the extra 75 units would be rented at 27% above the market rents for comparable units in the area. There was also the matter of a $50 million difference in the value of the site between the City’s valuation in the land swap and the BC assessment. The deal had not been put out to tender, and therefore the market had not been tested to see what other amenities other developers might be prepared to offer for the city’s site. It was a very complex process and hard to understand. Alice Sandberg did not look at the site specifically but examined the more general issue of local government’s role in providing affordable rental housing. She covered a lot of ground very quickly. “Affordable housing” is a relative term and can be applied to rental or ownership. “Social housing” specifically refers to rental housing which incorporates some subsidy from government to help meet the needs of specific groups of people. The development of either requires a range of financial and human resources – and she runs workshops on how to make housing affordable. At one time senior governments had a considerable role through capital grants, specialised mortgages, subsidies and rent supplements. The landscape has now changed. There are no supply side programmes: all are demand side and require the involvement of multiple partners. Senior governments – in Canada and BC – are driven by an ideological agenda and their priorities are to concentrate on the most vulnerable groups as well as emphasizing the role of private sector. Local governments have some tools in their regulatory toolbox that controls development: these include planning and land use controls, zoning, and development approvals. In addition they can provide financial incentives, land and partnerships. 5. Nathalie Baker did not make a presentation but responded to most of the factual questions: There was a two year process of negotiation between the City and the developer. This is not unusual and obviously during the process of negotiation there has to be privacy over the arrangements until the deal is finalised for public examination. However, that does not mean that when the proposal is presented facts that are material to the development can be withheld. The public hearing has to be informed if we are to get a smart decision that is in the public interest. Council decided yesterday that there needs to be more time to reconsider this development and fifteen other, similar deals. 6. Councillor Adrienne Carr said that there had been no formal meetings of the Council with the developer, though individual councillors may have attended meetings with staff and the developer. At yesterday’s meeting she was surprised to hear the City Planner use the phrase “when Council reconfirms the decision” as it is imperative that when the Council looks at the deal that the court quashed they have to have an open mind. There also has to be an opportunity for the public to comment on changes to the plan. Council also needs to reconsider its definitions of social housing and density bonus. 9. Gordon Price responded but I regret that my scribbled notes are unintelligible. If he reads this perhaps he can clarify in the comments. I do recall him observing that the longer he is out of office, the better it seems in hindsight. 11. The process to date has been a waste of time and money. How do we improve this? 14. What can we do to prevent bad decisions? 15. Randy Chatterjee: Why is it that governments only have capital programmes and do not provide help to maintain and operate social housing? I observed that this problem affects many other programmes – not just housing. There is no federal support for maintaining or operating roads, transit …. and so on. Alice Sandberg also pointed out that timber frame buildings thirty years ago were not designed to last much longer than that. Vancouver City Council has been given a very sharp check on its leash by the legal system. It should not be necessary for a Community Association to have to resort to the courts and Freedom of Information requests just to get Council to meet its obligations imposed by legislation and the Vancouver Charter. I was very impressed that Councillor Carr came to this meeting. She handled the situation with grace and aplomb and is clearly an asset. No staff or other councillors appeared: that says it all. We also need to elect much better governments federally and provincially that serve the people of this country – all of the people – not just the very wealthy and the big corporations. Public housing – like public transport – is an essential part of a civilised society. The private sector cannot and will not meet the needs of society at a reasonable cost.